Log on to my facebook page to see my baking demo videos. 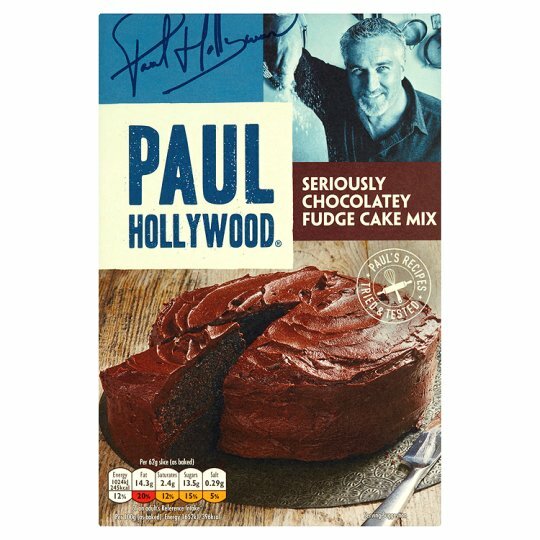 Check out my website www.paulhollywood.com/products for more handy baking hints and tips. I've spent years perfecting my baking, so I'm proud to bring you my baking mixes range. Developed to my own recipes, they deliver wonderfully consistent results and help you create artisan-style bakes in your own home. Store in a cool dry place., Best Before End: See Top of Pack. To customise: For an extra twist, add the zest of an orange to the cake mix before baking. Mixing: Be careful not to knock all the air out when folding the eggs into the cake mixture. Using a metal spoon or spatula to fold will help. 1 Preheat the oven to 180°C / 160°C Fan / Gas Mark 4 and line the cake tins with non-stick baking paper. To a large bowl add the eggs and whisk until doubled in size and are light and fluffy. Add the cake mix, milk and oil to a separate bowl and beat until combined. Fold in the whisked eggs to the cake batter, half at a time, until combined. 2 Divide the mixture between the two cake tins. 3 Bake on the middle shelf of the oven for 20-25 minutes. To test when baked, a skewer inserted into the middle of the cakes should come out clean. Remove the cakes from the tins and leave to cool on a wire rack. 4 Once cooled, sandwich the two halves together with your favourite filling, covering the top as well. A buttercream would work very well with this cake. And there you have it - A Seriously Chocolatey Fudge Cake!